Why do we need another adaptation of another Jane Austen novel? Particularly since this version of “Pride and Prejudice” looked so pedestrian and rote from the trailer and casting – Keira Knightley has never set my world on fire; and I love Judi Dench as much as the next guy, but must British casting directors be so unimaginative with the grande dame roles. The Internet Movie Database gives nine versions with this exact title (thus excluding the modernized “Bridget Jones Diary”), and with just a decade since the definitive 5-hour BBC miniseries with Colin Firth as Darcy, this film had “unnecessary” stamped all over it. But really, that’s like asking “why marry” to Austen’s famous opening line about men in possession of a good fortune. 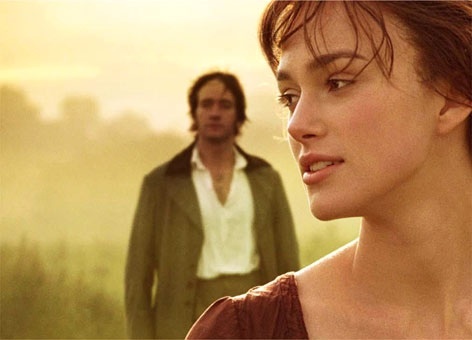 After seeing this latest “Pride and Prejudice,” I was asking “why not?” After all, it’s only the greatest novel ever written in English and only the work that has pretty much defined the modern romantic comedy template for nearly 200 years. There’s nothing despicable about wanting to see our favorite novels dramatized and seeing what real-life actors and directors can do with (or against) the images in your mind. While driving, I often listen to an unabridged Books on Tape of Irene Sutcliffe reading “Pride and Prejudice.” Heck, I even liked the semi-Bollywood Aishwarya Rai film “Bride and Prejudice” from earlier this year. As for the novel itself, well, however little known its feelings or views may be, this truth is so well fixed in the minds of the surrounding adaptation teams that it is considered as their rightful property. Austen wrote such a corker of a story, so rich on so many levels, that as long as you’re reasonably faithful, you almost can’t completely screw it up – there’ll at least be a decent plot as skeleton for whatever skin and muscle the film-makers choose to wrap around it. And it is another truth not-so-universally acknowledged that our memories of the original and other adaptations fool us by “filling in” gaps and firming up thin moments. As for the story, it’s mostly all there, though obviously some things are minimized – we don’t get much of a sense of the three younger girls until Lydia follows her heart and the results become central to the plot. For about 30 minutes, in fact, “Pride and Prejudice” quickly slashes through the compressed plot events – Jane’s rain-swept trip to Netherfield is hardly seen and the whole illness episode takes about a minute. But the choices made are generally smart. For example, Austen’s immortal, yet completely uncinematic, two opening paragraphs are entirely skipped in favor of a lengthy track through the Bennet home, establishing their material circumstances (think the start of Hitchcock’s “Rear Window”). The book’s first dialogue – Mrs. Bennet eagerly telling her husband about the arrival of Bingley – is briefly overheard and swiftly out the side of the camera’s eye as it wanders through the house. This “Pride and Prejudice” is filled with this sort of shot – it’s easily the most cinematically flashy of the decade-long string of Austen adaptations. The camera is constantly moving, catching things – like Mary’s bad piano playing – on the fly. The film’s high point (I thought the same of the 1995 miniseries) is probably the dance between Darcy and Elizabeth, which becomes a serious sideways-accusatory conversation. 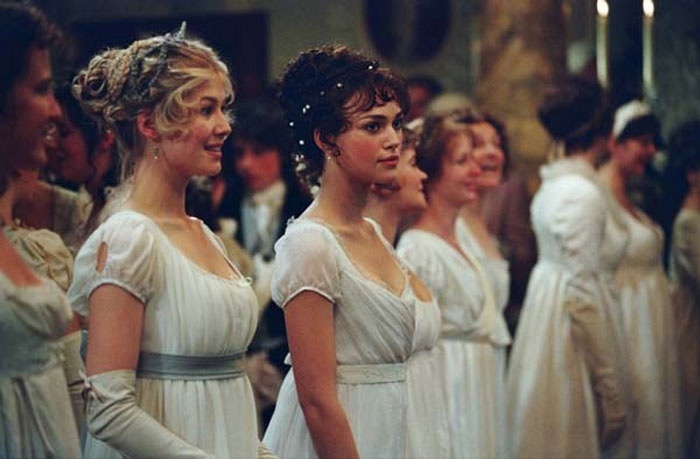 Here, the camera twirls along with the pair, as if we’re dancing too and eavesdropping as Darcy and Elizabeth become more absorbed (and not in a good way) in each other and each other’s opinion. Director Joe Wright literally erases the other dancers – first in sound and finally in images until it’s just the two of them “quarreling” (to the extent that people quarreled publicly in Regency England) all alone and then taking their final positions. In visual look, this film’s scruffy gentility (and that’s the Bennets’ status as “poor gentry”) most resembles the Austen world of “Persuasion.” There’s more rain and dirt here than we often get in British period adaptations. The Bennets’ home is kinda drab (we see the shabby cracks in the walls and hear the squeaks in the floorboards) and not too far removed from people who worked the land – chickens in the kitchen, pigs in the backyard, and all that jazz. There’s just no way around some of the ways “Pride and Prejudice” is unfilmable. It’s not just the felicity of Austen’s language – at least some dialogue is transferable (though much of the dialogue in the novel is irrelevant, if often funny or relevant via its irrelevance). It’s that Austen simply *told* most of the plot, often by describing people’s interior states, particularly the most important characters’ states. Austen’s characters also often wrote letters to one another, which are simply reproduced. Those are two techniques cinema resists, even the frequent attempts to reproduce the letter content as conversation. And inevitably, one will have disagreements with the characterizations as presented. Jane Bennet here is not as obviously good-souled as I see her; Bingley’s a bit stupider; I see Mr. Collins a bit more silly and flamboyantly self-absorbed than Tom Hollander’s loser with a constipated-face act; and Donald Sutherland just doesn’t fit the avuncular quality of Mr. Bennet’s weariness. Other actors do much better, often simply because the casting is right. 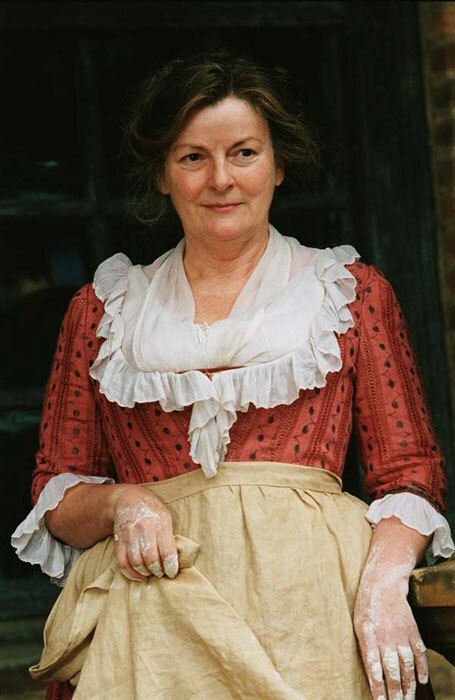 As Mrs. Bennet, Brenda Blethyn can play this kind of talkative “silly old biddy” role in her sleep. Jena Malone only gets a couple of scenes as Lydia, but she’s surprisingly effective as a pre-modern modern girl. Dench is just a compulsive addiction. I may groan at seeing her typecast (she’s Lady Catherine de Bourg, for those of you in Rio Linda). But those lips, those eyes – even those wrinkles – she just is regal imperiousness. I had heard nothing but bad things about Matthew MacFadyen as Darcy, and his performance is definitely at the stiff end. But somehow that seemed right for Darcy’s proud diffidence, as if he can’t be bothered to be here. And MacFadyen does loosen up a bit toward the end – as he should. As for Knightley, she at least is the right age to play Elizabeth Bennet (for a camp classic, see 35-year-old Greer Garson in the 1940 MGM version). Knightley’s a bit gigglier than Jennifer Ehle was in 1995, but her Elizabeth is a woman so intelligent and such an observer that the outside world are mere characters in her own private joke. In other words, she personifies Austen’s ironic sense of humor, if a bit bluntly. But it also plays well against MacFadyen’s muffled Darcy. As if each performance, like a real marriage, needs the other to play off it well. While the 1995 miniseries has entered the vernacular as the “Colin Firth” version, this one will be known as the “Keira Knightley” because it’s her joyful performance, and her joyful qualities as a person, that centers and defines the film. 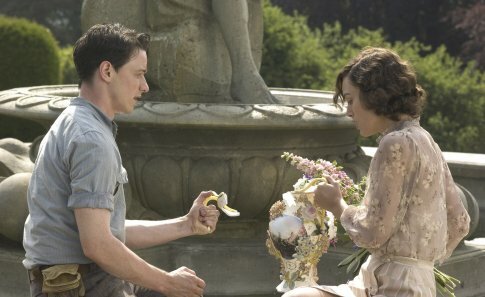 Which is why adaptations also, like marriages, need contrasts to play off each other.